Constant food supply for your fish. The ability to raise the protein content of the Brine Shrimp. Varied sizes (1 mm to 1 cm) for different feeding requirements. Fresh saltwater (SG of 1.018). Use an air pump which is powerful enough to deliver a good air supply to the bottom of the grow-out container. You will want to keep your Brine Shrimp and their food in constant motion. You can use small aquariums (10g or 20g) for the grow out containers, however plastic buckets (3g to 5g) or barrels (20g) seem to work better as they are easier to move around, don't have a tendency to break and are a lot less expensive. You will want to have at least 2 of these containers to facilitate maintenance (water changes) which must be performed about once per week. The containers used to hatch out the Brine Shrimp also work quite well and they are inexpensive. In order for the Brine Shrimp to grow, they require a constant food supply in a form that is palatable and is easily consumed. There are several yeast-based Brine Shrimp foods available on the market, however, they do not supply the shrimp with adequate supplies of nutrients which allow the shrimp to grow and build proteins. I mix one teaspoon of baby food pureed sweet potatoes and one teaspoon of baby food peas into one cup of water. I usually add a drop of liquid vitamin supplement, and often for good measure, I'll add a small amount of some fatty acid enrichment mixture such as Super Selco. Then I put it all in a small resealable bottle like the kind used for soda or water and shake well. The mixture will keep well in your refrigerator for about a week if it is sealed. Shake the container well before each feeding to suspend the food particles. 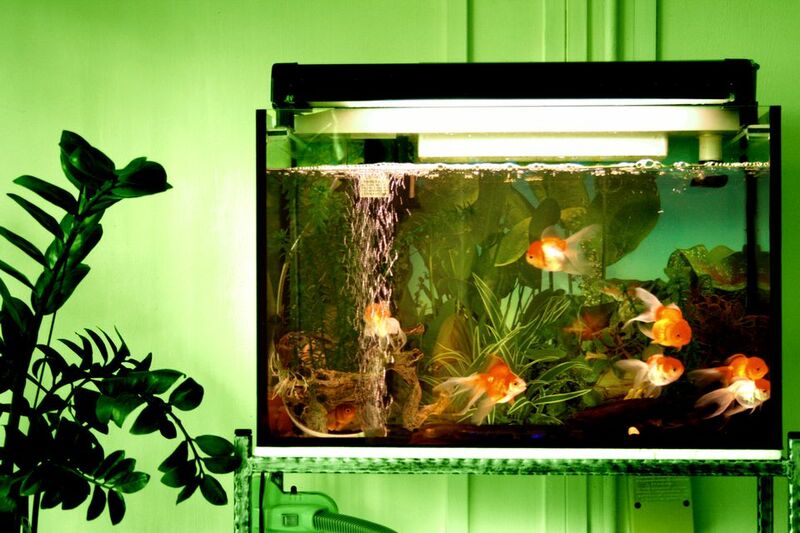 Since you will be accessing your Grow Out Container quite often, place it in an easily accessible location (close to your Brine Shrimp Hatchery would probably be best). Fill the container with saltwater at an SG of 1.018. Drop one or more airstones into the container. The water should maintain good circulation. Rinse your harvested baby Brine Shrimp with clean saltwater and release them in your Grow Out Container. For maximum results, your Brine Shrimp should have food available 24/7. At the same time, you don't want to flood the container with so much food that the shrimp can't consume it all, allowing it to settle to the bottom of the container and starting to decompose. Overfeeding will only add to your container maintenance. So how often and how much should you feed? It depends on the size of your Grow Out Container and your Brine Shrimp size and population. To begin with, when you have a small population of small Brine Shrimp in your container, it won't take much. A good "rule of thumb" is to feed just enough of the mixture to make the container water slightly cloudy. Keep an eye on the water and, when it appears to be clear (most or almost all of the food having been consumed), add some more food. Over time, you will know how much and how often to add food to the container. As you add more and more shrimp to your Grow Out Container (from the daily hatchings) you will need to feed more, more often. Feeding too much will add to your maintenance woes while feeding too little will not allow the Brine Shrimp to grow at their optimum rate. It is sort of a "feel" thing, which you will figure out in a short period of time. When the water in your 1st container (the one with the baby Brine Shrimp) gets to the "yucky" stage (debris on the bottom, slime on the sides and yucky foam on the surface), it's time for a container change. Turn off the air supply to your container and allow about 15 minutes for the debris to settle to the bottom and the Brine Shrimp to rise to the surface. Fill your second container with new, clean saltwater. With a fine mesh net, scoop the Brine Shrimp out of the 1st container and put them in the new container. Turn the air supply to the new container on, feed the shrimp and clean the 1st container in preparation for the next maintenance cycle. If you are not terribly excited about feeding your shrimp, you should be able to get by with only a weekly container maintenance.